The University of Glasgow has developed a new contact-printing system that prints and embeds silicon nanowires into flexible surfaces. The technology enables new forms of flexible electronics. It can be used to develop low-power circuits in flexible substrates, such as plastic, paper and fabrics. Researchers from the University of Glasgow have developed a new contact-printing system. The system is controlled with various parameters, including contact pressure and sliding speed/stroke, according to researchers. It makes use of a dry pre-treatment. The system can print nanowires using silicon and zinc oxide materials. These materials are printed on the bottom and top of a flexible substrate. Researchers have demonstrated the ability to print seven bottom-up ZnO nanowires and three top-down silicon nanowires. The average diameter of the nanowires is about 115nm. The nanowire-to-nanowire space is about 165nm. “This paper marks a really important milestone on the road to a new generation of flexible and printed electronics. In order for future electronic devices to integrate flexibility into their design, industry needs to have access to energy-efficient, high-performance electronics which can be produced affordably and over large surface areas,” said Ravinder Dahiya, a professor at the University of Glasgow. “With this development, we’ve gone a long way to hitting all of those marks. 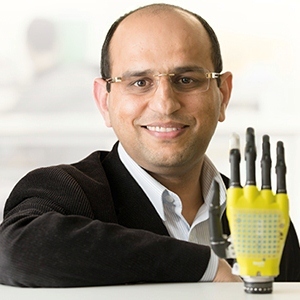 We’ve created a contact-printing system which allows us to reliably create flexible electronics with a high degree of reproducibility, which is a really exciting step towards creating all kinds of bendable, flexible, twistable new devices,” Dahiya said. “We’ve just secured further funding which we’ll use to scale up the process further, making it more readily applicable to industrial purposes, and we’re looking forward to building on what we’ve managed to achieve already,” he added. 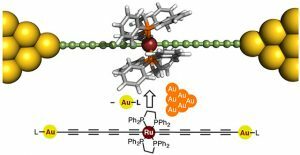 The Tokyo Institute of Technology has developed a new type of molecular wire for single-molecule electronic devices. 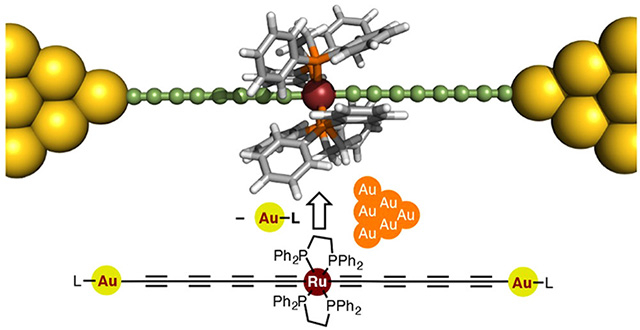 The molecular wire is doped with organometallic ruthenium. This in turn achieves higher conductance than other molecular wires. Molecular electronics is a promising field. The challenge is to connect one tiny molecular device to another. Another challenge is to synthesize conductive, stable wires from molecules. In response, researchers from Tokyo Institute of Technology designed a new molecular wire. The wire comes in the form of a metal electrode-molecule-metal (MMM) electrode junction. The wire includes an organic-chain molecule called a polyyne. The polyyne is doped with a ruthenium. This, in turn, enables a wire with high conductance. Researchers also found that MMM junctions are derived from so-called orbital splitting. “Orbital splitting induces changes in the original electron orbitals of the atoms to define a new ‘hybrid’ orbital facilitating electron transfer between the metal electrodes and the wire molecules,” according to the Tokyo Institute of Technology. A narrow gap between the highest and lowest occupied molecular orbital is critical. It is a factor for enhancing the conductance of molecular wires. “Such orbital splitting behavior has rarely been reported for any other MMM junction,” said Yuya Tanaka of the Tokyo Institute of Technology.